Forget horsepower. The connected car is becoming the hottest model on dealer lots. 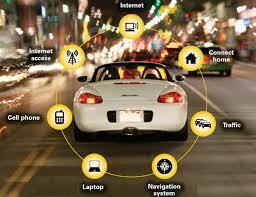 In-vehicle technology is the top selling point for 39 percent of car buyers today. This is more than twice the 14 percent who say their first consideration is traditional performance measures such as power and speed, according to a study that consulting firm Accenture released in December. That’s why cars that talk, show drivers the way and steer them from harm will cover the floor of next week’s Detroit auto show. Automakers at the show will be looking to push beyond what’s on the road today such as Tesla Motors Inc. (TSLA)’s Model S, with a large tablet computer on its dashboard that runs a jumbo-sized version of Google Maps for navigation, and Ford Motor Co. (F)’s Sync system, which the company credits for attracting customers even as it’s been criticized for imperfections. At the North American International Auto Show in Detroit next week, General Motors Co. (GM) will tout its 4G LTE-connected Chevys while Ford introduces more applications that work with its voice-activated Sync system, including those that allow drivers to activate a home security system from the car.